Photojournalist Nicole Tung (b. 1986) is an American citizen born and raised in Hong Kong. She graduated from New York University in 2009 after studying journalism and history and freelances for international publications and NGOs, working primarily in the Middle East, and also Asia. 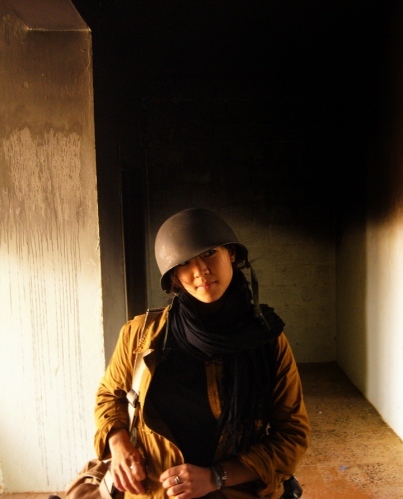 After covering the conflicts in Libya and Syria extensively from 2011, focusing on the plight of civilians, she spent 2014 documenting the lives of Native American war veterans in the US, as well as former child soldiers in the DR Congo, the pro-democracy protests in Hong Kong, and the refugee crisis in Europe. She is also a grantee of the IWMF Grant for Women’s Stories, and a fellow of the IWMF Great Lakes Reporting Initiative (D.R. Congo, Central African Republic). She has received multiple awards for her work from the International Photo Awards, Society of Professional Journalists, PX3, and was named PDN's 30 Under 30 Emerging Photographers (2013), among others. Nicole was given the honorable mention for the IWMF 2017 Anja Niedringhaus Awards, and awarded the 2018 James Foley Award for Conflict Reporting from the Online News Association. She has also exhibited, most recently at the Annenberg Space for Photography in L.A., the Freilicht Museum in Germany, and the Tropenmuseum in Amsterdam, and has spoken about at TEDx in Sweden, the Adobe Make It Conference in Sydney, and Creative Mornings at the National Geographic Auditorium in Washington D.C. Nicole served on the board of the Frontline Freelance Register (2015) and is has undergone HEFAT training with Reporters Instructed in Saving Colleagues (RISC) and Global Journalist Security. She is based in Istanbul, Turkey. *Images on this site are available for print. Please contact nicole@nicoletung.com for requests.